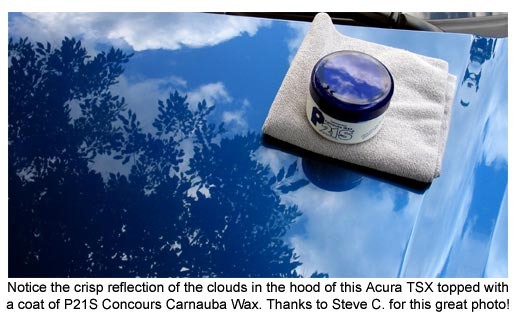 Ranked #1 by a top consumer reports magazine, P21S Concours Carnauba Wax will seal your finish with high gloss sheen! Premium Ingredients. Brazilian #1 yellow carnauba and beeswax, two premium ingredients preferred by car care experts, are blended to create this pure car wax that delivers a dynamic gloss enhancer for your vehicle. With the P21S Concours Carnauba Wax You will enhance and protect your car with the natural car wax that is the choice of professionals and enthusiasts worldwide. No White Residue. Seeing white after waxing can be disheartening, after all of the time you spend detailing your car. Trade in the white for a beautiful clear, glossy finish. P21S Carnauba Paste Wax is a non-chalky wax, leaving no powder residue or ugly white stains on rubber or plastic. 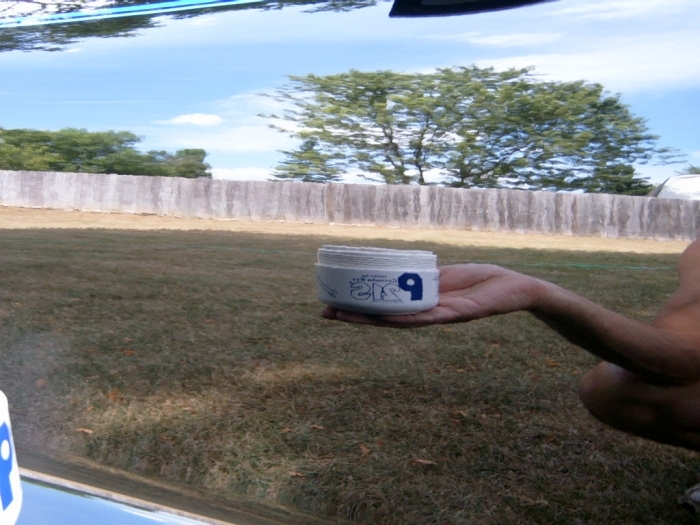 This car wax goes on and comes off with incredible ease and delivers a great long lasting shine. No Abrasives. This natural and smooth carnauba car wax does not contain abrasives, additives, dyes, or perfumes. It is a healthy treatment for your car that will enhance and protect every facet of your finish, and can be layered for extra depth. Easy to Apply. With the P21S Concours Wax you won’t have to rub hard to apply this premium car wax. Application is easy and foolproof, and this product will go onto your car’s finish like a layer of sheer silk. 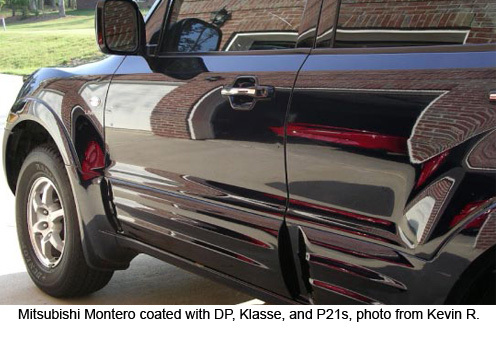 P21S Carnauba Paste Wax is truly a marvel, and will transform dull and uneven paint into smooth, uniform and brilliant color. Like precious gems, facets in your car’s finish will receive natural highlights through use of this car wax, and you will see results that last for a very long time. 175 gr. (6.2 oz.) jar with applicator pad and booklet. Have tried so many other waxes with mixed results. Very impressed with the ease of application and removal. The shine turns heads wherever I go. I just purchased and used the P21S 100% Carnauba Wax. Even easier to use and the results are breathtaking. ProsPrice, ease of application and removal. 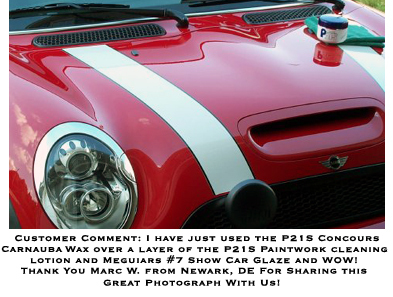 Used in conjunction with P21S Gloss-enhancing Cleanser, the Concours Carnauba-Bees wax gives a superb result. The wax is easily applied and removed by hand. The finished appearance is exceptional; clear, deep, lustrous, and mirror-like. P21s hands down the best wax by hand. Easy on and Easy off. Last for weeks, and multiple washes. In between wax weekends you can use a detailer spray to touch it up. Thin layers are better because it drys better and will not leave wax residue to dry later. used it a long time ago and tried new things but this wax has always been the best stuff I have ever used!! I am really pleased with this product! Have tried so many other waxes with mixed results.Very impressed with the case of application and removal.The shine heads wherever I go.